Lian Li today announces three new brushed aluminum cases, PC-Q02, PC-Q03, and PC-Q16, designed for modern users who need a compact central storage hub to share information among all their latest generation mobile devices. The Lian Li PC-Q02, PC-Q03, and PC-Q16 take advantage of the increasing efficiency of small form factor motherboards and progressively cheaper hard drives, and are able to hold the essential storage hardware in a small form factor. 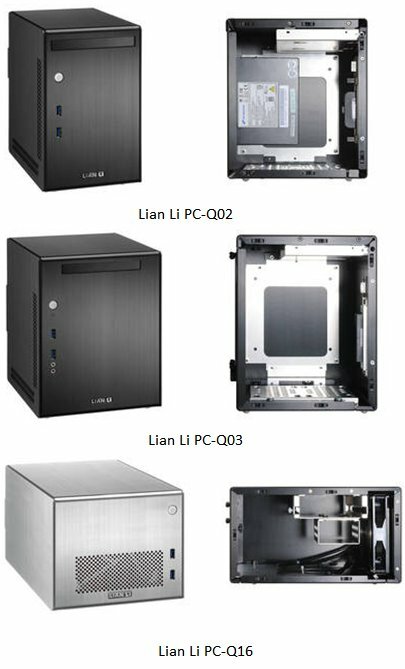 They also have high-quality features that are to be expected from Lian Li including: elegant brushed aluminum frames, easy-to-remove pop-off panels, USB 3.0 connectivity, rounded yet stable aluminum feet, as well as many tool-less features to make installations and upgrades easier. These three chassis also all have a dual LED power button which turns blue when on and glows red while reading. Supporting a mini-ITX motherboard, the PC-Q02's quiet fanless design gives users more room for their hardware while keeping the tiny dimensions of (WxHxD) 149 x 230 x 200mm (5.86” x 9.05” x 7.87”). While fanless, the PC-Q02 is designed to maximize the natural flow of air with vent holes located on the side and rear panels. This compact case has a 5.25” external bay on the front panel that can hold a slim optical drive or a 2.5” HDD thanks to easily installed slim ODD module. Inside the PC-Q02, the removable HDD tray on the floor on the chassis can support two 2.5” HDDs, or if the tray is removed a single 3.5” HDD can be installed. The PC-Q02 comes with a 300W 80 Plus certified SFX PSU included, and is available in two colors (Black or Silver) in selected countries and various vendors for the suggested retail price of $149.99. The PC-Q03 supports either mini-ITX or mini-DTX motherboards, and has the slightly larger dimensions of (WxHxD) 199 x 245 x 210mm (7.83” x 9.64” x 8.26”). Similar to the PC-Q02 in respects to storage capacity and the quiet fanless design, the PC-Q03 differs by having the capabilities to hold a VGA card up to 180mm (7.08”) in length – for enhanced graphics. The PC-Q03 also has HD audio ports on the front panel in addition to the two USB 3.0 ports. The Lian Li PC-Q03 can hold a PSU up to 160mm (6.29”) in length, and comes with a PSU mounting bracket for Micro-ATX power supplies included. The PC-Q03 is available in two colors (Black or Silver) in selected countries and various vendors for the suggested retail price of $149.99. The mini-ITX supporting PC-Q16 offers the most storage capacity of these three new Lian Li cases while still keeping the small footprint of (WxHxD) 199 x 160 x 290mm (7.83” x 6.29” x 11.41”) by sacrificing the 5.25” bay. The internal HDD bay located at the top front of the chassis can hold one 3.5” hard drive. A 1-bay to HDD SATA hot-swap backplane is optional. Hanging below this bay a removable HDD cage, using thumbscrews and rubber suspensions for reduced vibrations, can hold up to three 2.5” HDDs. To keep your hardware cool, a 140mm intake fan located at the front of the chassis blows cool air throughout the case. The PC-Q16 comes with a 300W 80 Plus certified SFX PSU included, and is available in two colors (Black or Silver) in selected countries and various vendors for the suggested retail price of $159.99.